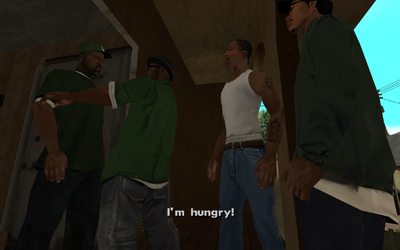 Big Smoke saying that he's hungry. Take Sweet, Big Smoke, and Ryder to a Cluckin' Bell, then attack a Balla gang car. Drive-Thru is a mission in Grand Theft Auto: San Andreas given to protagonist Carl Johnson by his brother and Grove Street Families leader Sweet from his house in the Grove Street cul-de-sac in the Ganton neighborhood of Los Santos, San Andreas. Carl finds Sweet, Big Smoke, and Ryder as he comes in his brother's house. Big Smoke suggests getting something to eat, and Carl drives them to the Cluckin' Bell in Willowfield where they order their food. Whilst they are eating their food, Ryder spots some Kilo Tray Ballas gang members in a pink Voodoo watching them and heading towards Ganton. The Ballas car turns around and performs a drive-by on Sweet's vehicle. Carl drives after the Ballas, whilst Sweet and Ryder shoot at the car, eventually destroying it. Smoke decides to eat everybody's food instead of helping the team attack the Balla gang car. Carl drives then back to Ganton, before driving Big Smoke back to his home in Idlewood. The rewards for completing the mission are $200 and an increase in respect. The missions Nines and AKs and OG Loc is unlocked. The Gyms across the state of San Andreas are available for use after receiving the phone call from Sweet. Cluckin' Bell Employee: Can I take your order, please? Carl Johnson: Hey, I'll take a number 9 - fat boy. Ryder: Gimme a number 9, just like his. Sweet: Let me get a number 6 with extra dip. In this mission, the Ballas are seen using a pink Voodoo with tinted windows. This is odd since the Ballas do not use the Voodoo as a gang car, but instead, the Grove Street Families use the Voodoo as a gang car. The only way to make the Ballas use the Voodoo as a gang car is to modify the cargrp.dat file. The pink Voodoo was earlier seen in the mission Sweet & Kendl. At the end of the mission, the Greenwood will be fireproof. Sometimes, the Voodoo will crash into a police car and will get stuck there, thus giving the player time to kill the gangsters. Carl Johnson, Big Smoke, Ryder, and Sweet order Cluckin' Bell food, but later Big Smoke gets Burger Shot food. In the start of the cut scene where Big Smoke, Ryder, Sweet, and Carl are ordering food, sometimes you can see Big Smoke in a T-Pose. This is the only time in San Andreas that the drive-thru section at a fast food joint is used. Carl Johnson, Sweet, Big Smoke, and Ryder ordering food at Cluckin' Bell in Willowfield. Two members of the Kilo Tray Ballas passing by the Cluckin' Bell and heading for Grove Street. Sweet and Ryder shooting the Ballas' car. CJ dropping Big Smoke off at his place. This page was last modified on 17 February 2018, at 19:13.